If you require more help in identifying a gold hallmark, try our gold hallmark identification wizard. Hallmarking (also called assay or standard marking) is the official quality control mark that determines the purity of gold and other precious metals. To receive a price quotation using our scrap gold calculator, you’ll need to know the weight and type of gold you have. Fortunately, modern digital kitchen (or postage) scales are very accurate, allowing most customers to gain a relatively accurate indication of the weight of their gold. Identifying the type of gold can be a little more tricky, which of course requires us to read and decipher the hallmark stamped on the item. For the purposes of explaining the various marks, we’ll use this ring. The first mark we see is the makers mark, telling us who manufactured the item (in this instance, H Samuel). The next mark we see is a Crown or Gold Standard Mark. This was first introduced in 1798 and can now been seen on all UK hallmarked gold that’s 9, 14 18 and 22ct. The crown also appears on old 12 and 15 carat gold, however this was stopped in 1932. We now come to the mark that tells us the gold fineness (purity). First, let’s look at the shape stamp. You’ll notice it’s a rectangular shape with the corners shaved off. This again tells us the item is gold. An oval stamp would indicate the item is silver and a ‘house’ shaped mark is used for platinum items. The Hallmarking Act 1973 stipulates the use of the above symbols to identify the precious metal. This millesimal stamp number tells us the precious metal content. As our gold ring in the photo was made prior to 1973 (Hallmarking Act), the markings are slightly different, but still easy to understand. 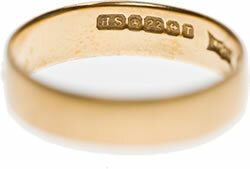 In our example, you can see the ’22’ stamp, indicating 22 carat gold. As you can see, this ring was assayed in Birmingham. The final stamp on our ring is the date stamp which tells us the year this item was tested and certified for fineness. The shape of our letter ‘T’ tells us this ring was hallmarked in 1968. As you can see, a hallmark can tell us a lot about the item. Providing you can identify the type of gold you have and its weight. you can use our scrap gold calculator to work out the value of your item(s). Don’t worry if you can’t find these details out. We can still value your scrap gold and you’re under no obligation to accept our offer -we’ll always return your gold, free-of-charge. im after some information on a ring. it has 4 symbols. first is a head second is a crown third is the number 18 and fourth is a anchor. Your ring is 18ct gold, hallmarked in Birmingham, UK. If you visit our Gold Hallmark Wizard page, you’ll be able to date it. I have a small ring with marks that I cannot identify. next there is a square adjoining a smaller rectangle- in the first larger square the appears to be a C to the left of a helmeted head ( not unlike the Latvian symbol) and then in the adjoining smaller square are the numerals 585. Can you possibly identify this? Thank you. We’re unsure as to the orign of your ring, but the 585 mark indicates it’s 14ct gold. i can’t identify what my markings on my ring mean, first there is the initials “W.H” then the number nine? I can’t be sure. Third, there is the number ‘375’, then somthing simliar looking to an anchor but i cannot be sure, aiming left. Lastly, there is a funny “A”. Can somone please help? Thanks. Your ring is 9ct gold and was assayed in Birmingham. Use our hallmark wizard to date your hallmark (from the shape and style of the letter ‘a’). Hi, I bought a ring yesterday but I couldn’t see hall mark anywhere although I was told that it is hallmarked. On the receipt it is written by hand 18ct gold..but no certificate or warranty was given. Can I trust that the ring is actually 18ct gold? Is there any regulation that hallmark must be incorporated on the ring or should I bring it back for refund? Are you located in the UK? By law, any item of gold weighing more than 1 gram MUST be hallmarked. It is a criminal offence to sell an item of jewellery, describing it as gold without a hallmark. Initially, I would suggest you get it tested. You could take it to another local jeweller and ask them to value it for you. If the ring turns out not to be gold, you should lodge a complaint with your local Trading Standards office. …But many items of antique jewellery are not hallmarked. Is it a new or old ring? A heart with the letters P N inside followed by a box with 9375 followed by a circle with III and then another circle with what looks like a V ? The letters PN are the makers mark. The 9 and 375 marks indicate your ring is 9ct gold. The letter V will tell you the date it was hallmarked. Try our hallmark guide for more information. i was given a ring from a friend its marked 925 now i know this number represents silver, my problem is the ring is gold coloured and looks real against my other gold rings, is this ring gold plated or is it possible it could actually be gold? With a 925 mark, it’s unlikely that your ring is gold. As you’ve indicated, it’s probably plated silver. However, the only way to to confirm this is to get your ring professionally tested. then a Rose. So its from Sheffield. Can you identify the CH? The CH is probably the maker’s mark. Unfortunately, it’s not one I have any information on. Am i to understand that it is 9ct, 375 fineness (so 37.5% gold) and hallmarked in London? What does the ‘k’ and ‘0’ stand for? Yes. 9ct gold, hallmarked in London. The ‘k’ is probably the date mark. Unsure what the other mark is without seeing an image. Have you tried our hallmark wizard? Your hallmark wizard is great, but I can’t identify the maker on my ring. I have determined that it was made in 1897, 18Kt and made by L&L. There is a number at the top inside of the ring which is 729. Unfortunately, we don’t identify maker’s marks at the moment. Building the database of year marks was a huge undertaking… Maybe we’ll look at expanding on the wizard at some point, but it’s not something we’re planning right now. i bought two seperate gold chains from a second hand store and am not sure if I made a good buy or not. The only hallmark found on the two chains is the name Americaner. Could this be anything more than a makers name? Do your chains stick to a magnet? If they do, I’m afraid they’re not gold. If they don’t stick, the only way to be 100% sure will be to take them to a jewellers for testing. I have a ring that is supposed to be rose gold. The markings inside the ring are A “P” inside a circle and a crown inside a square. Is this a common marking and it it really gold? The letter ‘A’ is your date mark. Use our hallmark wizard to find out the date your ring was assayed. 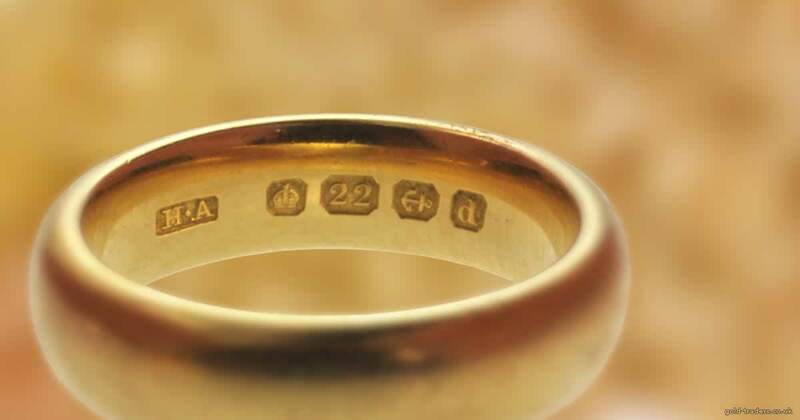 hello i have an older gold ring, it has 750 fine stamp and the gold crown indicating english. what puzzles me is there is shield hallmark with 3 crosses in it. do you know what that means ? Could those marks you think look like crosses actually be castles (two above, one below)? If so, that sounds like the assay mark for Newcastle, which closed in 1884.
also i have another ring, that has an N stamped on it, am i corect to assume its made in 1989 ? also the maker J.N.W do you know who that is ? You’ll need to use our hallmark wizard to identify the date. Sorry, we can’t help with maker’s marks – there are too many! Your bangle is Sterling Silver (lion mark) and was hallmarked in Birmingham (anchor). While researching my family tree, I have also been trying to find information on a ring I have, its very heavy & think it is made from Australian gold. On the ring there is a crossed pickaxe, shovel & wooden stake, on the inside band, the inscription reads (with these I got it) & the letters (L&W), there no other markings at all. Appreciate any help at all concerning the maker, when they were established & ceast trading. I have a rose gold albert chain with 9 375 on each link and MB plus 9375 stamped on bar, any idea of age etc. You’ll need to find the full hallark (probably near the clasp) and use our hallmark wizard to work out the date. I have a bracelet with the first symbol being ALD do you know what this means? my ring looks like silver or white gold but all it says is 925 what does this mean? is it real? 925 = silver (92.5% / sterling silver). I just bought a ring that has marks that I can identify, and marks that I cannot. A “9” in a square shape, followed by a “.375” in a square as well, a sideways anchor and a “t” in a square. What’s here tells me that its 9 carat gold, Birmingham and from 1893, the only thing I can’t figure out is the 9? Sorry, we can’t offer any assistance in identifying makers marks. i have a ring that says dia i was told it was gold by the shop is this gold or not?????? Dia is probably short for diamond. Does it have a stone set in it? Withougt a hallmark, it’s impossible to confirm if your ring is gold. Having said that, if there’s a diamond in your ring, it’s fairly safe to assume it is. As far as its purity is concerned, you’d need to get it tested. This stamp indicates that your item was hallmarked prior to 1975. It is 9 carat gold. Your item was assayed in Birmingham. Your item was hallmarked in 1817 owner? Yes, that’s the maker’s mark. It’s not something we can help you in identifying through. I have a ring with with a 22 stamping inside of it with a 7 on the opposite side. Do you think it’s real? Impossible to say I’m afraid… Pop it over to your local jeweller, who will be able to confirm its authenticity very quickly. I have a gold musical snuff box with the marking of a Lions head and a Capital T and another side view of a head? On the lid in a Lion and Capital T. Please could you help with this . Sounds like your box is made from Sterling Silver. 9ct gold, hallmarked in Birmingham. Hi I have what looks like a rose gold scarab beetle pendant carved from lapis. The bail and pendant setting are stamped with V. Can anyone help to confirm if this is gold and if so how many carats? It could be an older hallmark or foreign? Hi Jenny, you’ll need to get it tested to confirm it’s gold. If it comes to us, it’ll get x-rayed to ascertain the purity.